Everyone has a bucket list. However, how many of us have a reading bucket list???? This list can include the classics (such as Of Mice and Men, A Tale of Two Cities), Sci Fi/Fantasy favorites (such as Ann Rice’s Vampire novels or the Louisiana Vampire Series), the latest Physics theories, or the newest Young adult fiction series (the great Harry Potter owns the corner on this market, but there are other notables like Rick Riordans Heroes series that are so delicious and The Hunger Games series that I couldn’t put down). Yeah I’m that kind of nerd. My list has all of this and more. My favorite category of literature, though, are period pieces. I love the past, but specifically, I like the idea of going back in time and trying to process things the way others would have with the moral code of the times. The latest in my list consumption was The Great Gatsby. In case you haven’t read it, I won’t spoil the actual plot points or anything. I will just say it is a ridiculously sad book. It brings home the saying of “there are no happy endings”. I thoroughly enjoyed it and now CANNOT wait until Baz Luhrmann’s film version! I love what he did Romeo + Juliet and Moulin Rouge so I hope it is more in that vein, as opposed to Australia (the film, not the country). In particular, I look forward to seeing how they navigate the point of view. Also, it is inevitable that every book-turned-film loses a bit of content, and its not always the useless bits you want to see cut out. I am hoping that Baz gets rid of a lot of useless bits that irritated me as a reader. However, I am fearful that there will be some issues with the resolution. The book does this rather abruptly I’m not sure this will translate gracefully to film. I guess we’ll find out in May 2013! Who knows, maybe by then I will be adventurous enough to do a Vid Pod Quo! 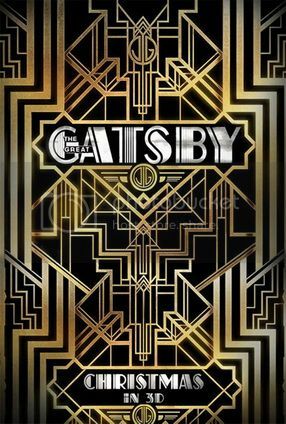 This entry was posted in Mini Review and tagged Baz Luhrmann, Carey Mulligan, F.Scott Fitzgerald, Great Gatsby, Great Gatsby Review, Isla Fisher, Leonardo DiCaprio, Tobey Maguire by Justine. Bookmark the permalink.